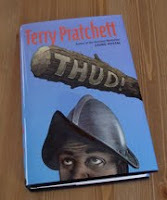 congratulations on finding the brilliant Terry Pratchett. Though the books don't need to be read in any order, I think you will find it interesting to read the first couple, and see how much the disc has evolved over time. Hi Andrew, Long time no speak. Glad you discovered Pratchett (my favourite author). I suggest that if you like THUD you read Gaurds Guards and Night Watch next to get the full flavour of the characters in this series within a series. Terry Pratchett's stories, though centred on the Discworld, basically follow a number of themes. Plus a number of stand alone stories. All have brilliantly drawn characters but all display the truth that Terry Pratchet isa phenominally good observer of people and if you remove the Discworld setting you will find that you have encountered most (if not all) of these characters in real life. And if you enjoy the main series then you will also enjoy the childrens series (try Maurice and his Amazing Educated Rodents' for a brilliant take on the Pied Piper story. I think your daughters and your wife will also enjoy the childrens series. PS - Sorry I've been so long without writing. Hi Rob,Good to hear from you. I will definitely check out more of Pratchett's series. I really like his mix of the grim and the light-hearted. I've been bought some but haven't painted them yet.